This song below is a summary of the Song Of Solomon in the Bible. It is a romance song to God from a human. It is also vis-a-versa, God to human. Each day God is romancing us back to Him, telling us to repent and seek His face. I got this out of a book title “A Woman’s Heart That Dances: Keeping in Step with God’s Design for You ” by Catherine Martin. To me it was inspiring. I had to copy it to put in my spiritual journal and I want to share it with you. Jenny was plain, not pretty like some other girls. Indeed, in front of the mirror, Jenny sometimes felt ugly, worthless, and unlovable. High school teens tend to be at least as shallow as adults, so kids at school made Jenny’s life miserable. She went to all the school dances, but she was never asked to dance. The other girls teased her mercilessly, and the boys often raised her hopes only to let her down. One night Jenny cried herself to sleep after attending a school dance. She had dressed up in prettiest clothes, put on her makeup, and gone to the dance with high hopes. Someone would surely ask her to dance. But all through the dance she sat on a chair next to the wall. A couple times her heart leaped when a boy came toward her, but then her heart sank when he asked one of the other girls to dance. Tears drenched her pillow that night. Anger bitterness, and pain rocked her to sleep. But then the remarkable happened. A restless, fitful sleep was suddenly transformed into a marvelous, fantastic dream. In her dream, she was at a magnificent dance—the spectacular dance hall was filled to perfection with streamers and laughter and music. Silver balls hung from the ceiling, spraying bits of light that flashed over the entire gathering, bounced from the dance floor, spilled off the walls, and lit up faces. The handsome men were all dressed in tuxedos. The elegant women wore formal gowns of lace and silk and were adorned with orchid corsages. Jenny was dressed in her finest, standing alone next to the wall. She was stunned__shocked to disbelief. She desperately searched faces in the crowd to determine whether this was a practical joke. Were they smirking?“ Laughing at her? She been cruelly tricked like this before. But this beautiful man kept looking directly into her eyes and insisted, “Jenny, I’d like to dance with you.” At that moment, with her heart on her sleeve, she trusted! But Jenny didn’t know how to dance. No one had ever asked her before. And even though she felt clumsy and awkward as the handsome stranger whisked her to the dance floor, she found herself safely in his arms. Soon she was dancing with abandon, thrilled to discover a divine freedom as she followed his lead. She floated on air without a care in the world, her soul overflowing with joy. She could dance! “I’ve wanted to dance with you for a long time, Jenny,” the handsome stranger said, drawing her close. She could hardly believe what she was hearing! Then she heard him say, “I love you Jenny. I love you with all my heart and all my soul and all my strength.” Cautiously, she searched his eyes. She could see the passion of his unconditional love. And suddenly she knew the name of this beautiful stranger. 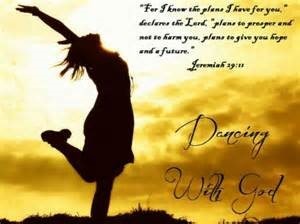 She was dancing with Jesus. Jenny is every girl in her most awkward and difficult moments. We have all experienced those times when we think, “No one likes me. No one even knows I exist. I don’t see any hope for my life.” You can replace her name with your name. Or you can fill in a friend’s name. Or add mine, for that matter. 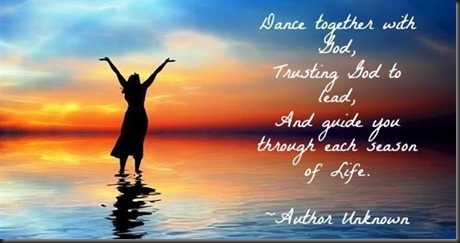 The astounding truth is that whoever you are, whatever you have done, and however impossible your circumstances maybe, Jesus, who loves to dance , wants to dance with you. I really like the story. It’s amazing! I thought so too, :).